Taurus, the Pleiades and Alcyone are often cited as the stars around which our universe revolves. This is true, but they revolve BELOW our Sirian and Ursa Major Systems. They represent one of the lower centers in the Cosmic Logos transmitting a higher correspondence to kundalini energy from the basic center, Draco. Take a look at Chart 1, The Seven Cluster System ‘in Motion’ at www.sevensuns.us above. It should be clear with an elementary grasp of astronomy or logic that the proper motion of c.5-15A [approaching] for Draco, c.5-10A for Ursa Major and 0-5A for the Sirian System stars in relation to the 5R [receding] proper motion for the Pleiades indicates that the Ursa Major seven head centers with their convergence point in Capricorn indicate a spiral-forward vertical axis which places the Pleiades in a lower position, probably related to the heart center, but definitely moving in the opposite direction toward the Scorpio-Centaurus convergence point with the other 4 cluster systems (constellations) or Cosmic LOGOIC systemic (‘physical’) centers of the UNKNOWN LOGOS. These seven clusters are between the Orion Association of giant white stars (the future) and the Scorpio-Centaurus Association of red giants (the past). 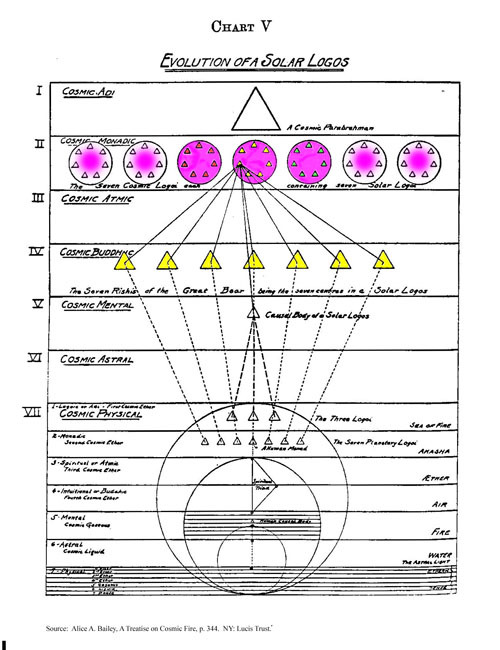 In Chart 1, the central three constellations or systemic aspect of the 7 Cosmic Logoi are our Three Great or Intimate Constellations of Ursa Major, the Sirian System, and the Pleiades, all three directly related to the solar Logoic Triad. (1058) The other four moving clusters or Cosmic Logoic systems are placed two on either side. In Chart No. 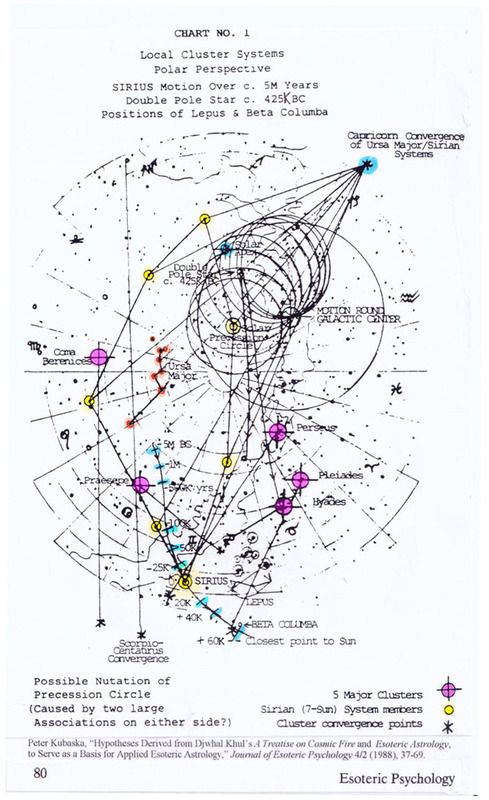 1 above, I have drawn in several of the 25,000 precession circles as they (and we) spiral around the Galactic Center during galactic rotation. The spirals (circles) are depicted as they were in the past, indicated by the position of the Double Pole Star of 425K BC to the 'north' of our present Precession Circle. If it takes 250 million years for our Sun to rotate around the galaxy, then this involves 10,000 Precession Cycles. This spirallic motion of the Precession Circle, along with the sinuous spiral movement of the position of the Star Sirius from 5M BC to 60K AD, illustrates the spiral-cyclic nature of both the individual constellations (such as the Sirian System of 7 stars) of our Cosmic Logos, but also the spiral-cyclic movement of the 7 constellations of the Unknown Logos. As we look at the Sirian System of 7 Suns, it should become apparent that each Sun represents one Spirilla of the physical permanent atom of the Cosmic Logos. Our Sun is said to be of the IVth Order, and is the heart center in the Sirian System Logos. This is suggestive of fourth spirilla development. Reference: A.A. Bailey, A Treatise on Cosmic Fire. 1925, 1962 ed., 1982 pr. NY: Lucis Trust. Reference: H.P. Blavatsky, The Secret Doctrine, Centennial facsimile ed. Los Angeles. Theosophical University Press, 1988. Peter Kubaska © August 2008. AWE at TS in Boston.